A short look back at the first Canadian rap album. Canadian hip-hop’s movin’ on up in the game. Take, for example, the recent popular success of Drake. Last year, his mixtape So Far Gone made him a household name, earning him a Vibe magazine cover and a performance slot at the 2010 Grammy Awards. (Only a freak knee injury kept him out of Lil’ Wayne’s tour last year). And Drake’s eagerly-awaited debut album is due out this year. Recording with some of the biggest names in the industry, including Weezy, Kanye, and Eminem certainly hasn’t hurt the former Degrassi star either. The single “Forever”— from the soundtrack to More Than a Game, a documentary about NBA star Lebron James— features that foursome belting out some smart verses that address the drive to succeed in the music industry as well as attendant anxieties related to the prospect of selling out and the sycophants that fame inevitably spawns (“Now super bad chicks givin’ me McLovin’ / You would think I ran the world like Michelle’s husband / You would think these niggas know me when they really doesn’t”). Born in 1986, Drake was still in diapers and learning to walk when Toronto’s Michee Mee and Maestro Fresh Wes— the mom and pop of Canadian hip-hop— began making names for themselves with tracks like “Jamaican Funk” and “Let Your Backbone Slide,” arguably the best Canadian hip-hop recordings ever. In 1987, Michee Mee was featured on Break’n Out, a compilation album of Canadian rap artists produced by the South Bronx’s own KRS-One and Scott La Rock, of Boogie Down Productions fame. Michee Mee was also the first Canadian rapper to sign with a major American label. In 1989, Maestro Fresh Wes’s “Let Your Backbone Slide” cracked the top 40 in America, the first Canadian rap track to do so. It remains the best-selling Canadian hip-hop single of all time. But if Michee and the Maestro are the designated mom and pop of Canadian hip-hop, then Bobby Deemo is the grand-daddy of ’em all, from Maestro and Michee all the way down the family tree to Rascalz and Choclair and now Drake. That’s right, Bobby Deemo. Name doesn’t ring any bells? That’s ok. Deemo’s pretty much a forgotten figure in the history of (Canadian) hip-hop. But in 1980 and ’81, when rap records began to flourish in the TriState area, Deemo released a handful of singles— including the exceptional “Party Rap”— and one full-length 12” that, as far as I can gather, certify him as THE first Canadian rapper. There’s very little info out there about Bobby Deemo. He recorded a few singles, like “Do It Rap,” in Toronto-based studios in 1980. However, the label that produced his first singles, Scorpio, was located in the east-end suburb of Scarborough. So it’s possible that Deemo was actually from Scarborough. But Deemo also had ties to Buffalo. 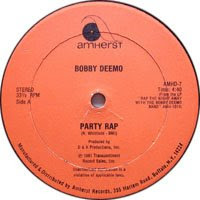 Buffalo’s Amherst Records, run by Leonard Silver (who also owned and ran the Record Theatre music-store chain), produced and distributed Deemo’s first full-length album in 1981: Rap the Night Away with the Bobby Deemo Band— as the album’s title suggests, apparently Deemo had a full-time band. The label on the “Party Rap” 12” indicates that the song was written by “N. Whitfield.” The “N” stands for Norman, according to hip-hop discographer Freddy Fresh. Norman Whitfield, of course, is the composer who helped define the Motown sound. It’s likely that Deemo composed the lyrics, and his band “covered” a Whitfield composition. The musical track is a hi-hat heavy, mid-tempo funk. “Party Rap” remains, unequivocally, Deemo’s masterpiece. Its lyrics are, in part, mostly what you’d expect: boasts of lyrical prowess; descriptions of bumpin’ club scenes; and the occasional crass punch line, like when he tells an overweight woman on the dance floor to “exercise for the rest of her days.” But there’s also those elements that are totally wackadoodle, making the track rather anomalous— and making Deemo something of a precursor to someone like Ghostface. For example, throughout the track, Deemo assumes the persona of “Seaweed,” “the funkiest dude in town,” who has arrived “on the surface” and is here “to make you dance and prance / with fresh funk from the sea.” Appropriately enough, the song begins with some low-tech “bubble” sounds meant to evoke an “underwater” atmosphere prior to Seaweed’s vocal’s emergence on the street. From start to finish, Deemo revels in his preposterous yet utterly compelling conceit. At one point, he compares himself to “MGM’s creature from the black lagoon.” Later, he imagines “backstroking in the middle of the street” and jamming with President Reagan. And my favourite: he describes a fella dancing as a “whale with all his tail,” with tail having all the connotations you might expect. So, without further ado, take a whiff of that “fresh funk from the sea,” and celebrate some old school Canadian hip-hop.